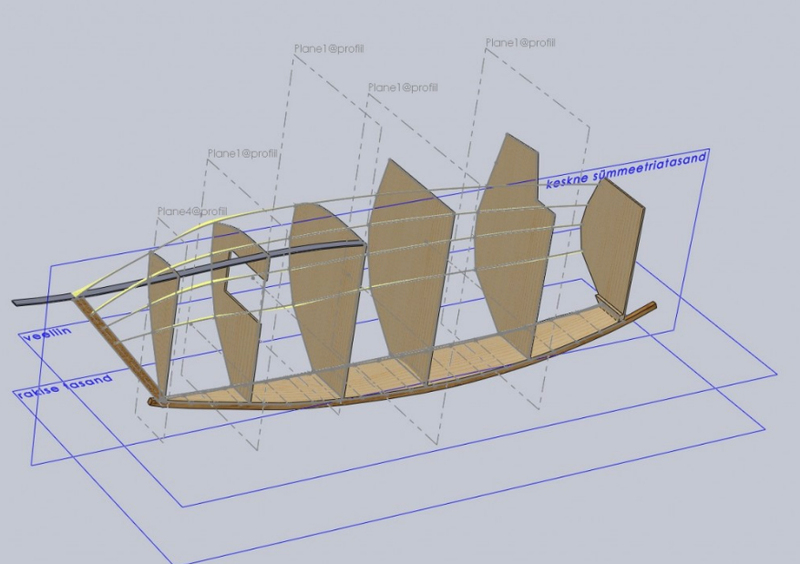 We initially had difficulties understanding the construction plans of our boat. Errors were made and insecurity rooted in what-goes-where. Additionally we decided to modify the bow of the ship. Numerous measures and error-cut bulkheads later we decided to model our solutions in 3D. As physics students, we have access to the student license of Solidworks, a modern engineering software. This gave us a starting point. We had previous experience with the software. Joosep decided to give it a try. Here are the results. As you might have noticed, for a long while our sidebar was adorned with the words ‘3D modelling in progress’. What this meant was that I was trying to make the model conform to reality instead of the plans. This was a lot more effort than I expected, since the original model did not have the right degrees of freedom. In any case, I spent a few evenings with a measuring tape and a few more evenings with the modelling program and here are the results. I think that in the case of modelling one has to ask a question and then work with the program to get the answer. One doesn’t just do it for fun. In our case the question was: what are the dimensions of the forward bulkhead, so that the stringers sit nicely on the frame? 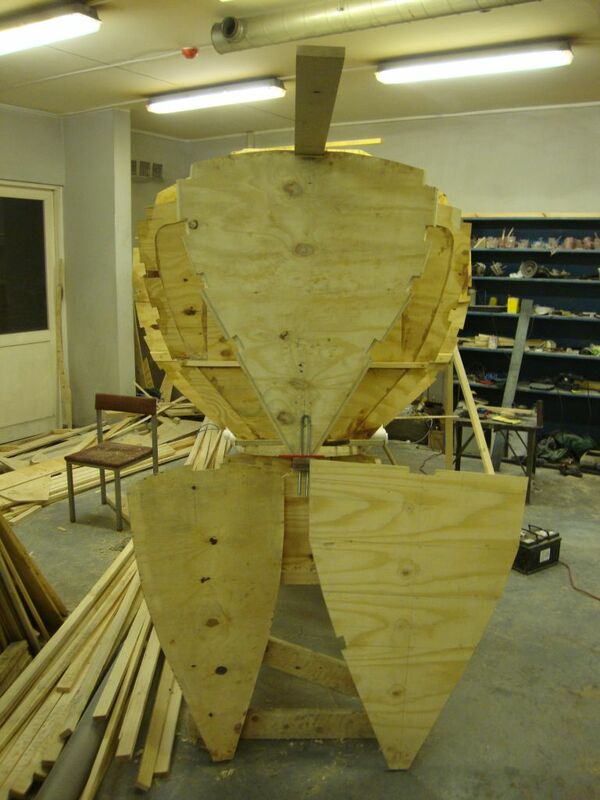 Our three forward crash bulkheads. Starting from the original in the lower left, version beta on the lower right and the current in the middle. A linear progression in size. To answer that, one has to define ‘nicely’. In our case, it means that there should be no abnormal S-shape in any direction, that is the stringers curvature has to be outward-facing in their entirety. Easy enough, right? Wrong. There are very many free parameters in our case and the only way to find a solution for the lateral dimensions of the forward bulkhead was to fix some of them, for example the exact spot where the stringer intersects the bulkhead and so forth. In the end you’re working with mathematical abstractions (splines) instead of wood that has a mind of its own, so one can never be too sure of the model, in my opinion. The main difficulties lie in taking into account the deviations from mathematical perfection, for example our bulkheads are not perfectly planar but a bit warped (1-2 cm in the middle). Nothing terrible for the boat but quite difficult to model. However, I think the strong point of the modeling is that is forces you to think things through in a detailed fashion, something which is difficult with just pieces of wood, especially if one has little experience in carpentry (such as me). Preparing the model certainly helped me systematize my vision of the boat and provided me with some assurance that we’re on the right track. We didn’t end up using the dimensions we got from the model, due to a lot of freedom involved in their choice, but it definitely helped. So you see, it ended not with a bang but a whimper, but I’d recommend future builders to try modeling at first if you feel somewhat unsure in carpentry. It took about 2-3 weeks to learn modeling, I think now I could do a more or less finished model in about 2-3 days, which significantly decreases the time you spend bewildered in the workshop, longing for an absolute frame of reference. Coincidentally, if anyone needs any modeling done, I’m open to propositions and have access to Solidworks.